5 Seconds of Summer concerts bring out the best, and the worst, in me. I have seen them over twenty times in Boston, Connecticut, New York, Colorado… You name it, I’ve been there. I’ve cried a few times at their shows, but only once from the pure joy of seeing them. Being sleep-deprived, starving, stressed, yet still happy can definitely provoke tears at the smallest of things, and I’ve had my fair share of emotional moments caused by 5SOS. The worst I have ever cried at a show was in 2016. It was at Mohegan Sun, and it was opening night for Sounds Live, Feels Live. I woke up early for soundcheck, and by the time the concert rolled around, I was exhausted and running on adrenaline. I had met Ashton, the drummer, that morning, and he had responded to one of my tweets before the show. I had never been so happy. Then, the infamous jump during their final song was my last few seconds of happiness. I vividly remember sobbing in the center of the fourth row during She Looks So Perfect. And no, it’s not because the show was ending. For those that listen to 5SOS, you know "She Looks So Perfect" is a jam, but definitely not tear-worthy. During "She Looks So Perfect", 5SOS jump in sync at a specific moment of the song; they have done it every single time I’ve seen them live. Usually, this is when confetti cascades from the ceiling, but this time, giant balloons dropped into the crowd. These weren’t just any balloons. These were heavy, gigantic red balloons. Here’s the thing: balls scare me. Laugh all you want. Years of middle school gym class humiliation has made me fear any and all round objects that can be thrown at my face. My usual instinct is to duck and hide whenever such objects are around. Obviously, when at least a dozen giant balloons are dropped from above, there is no way to hide. The only options are to get hit in the head, smack the balloon (the normal instinct), or hope someone around you hits the balloon. The girl behind me was too eager to hit the balloon. My finger was yanked backwards and a sharp pain shot up my arm. “I think I just sprained my finger,” I told my mom, who came to the concert with me. My mom started hysterically laughing. I am a delicate flower, so I’m sure she thought I was being sensitive. “No, I’m serious,” I told her. Suddenly, a flood of tears erupted, and I couldn’t stop them. My mom, still hysterically laughing, tried her best to console me. I couldn’t move my finger, and it was already beginning to swell. Then, I remembered where I was. I was a little over an arm’s distance from the stage where 5SOS stood right in front of me. I began to cry harder from embarrassment because I was sobbing during "She Looks So Perfect". Why not "Amnesia"? Or "Beside You"? I was so worried 5SOS would see me sobbing during their least emotional song. My 17-year-old self still had a tiny glimmer of hope that a member of 5SOS would see me in the crowd and fall in love with me. I knew my mascara was all over my face. My eyes were probably red and puffy. I knew I was a mess. 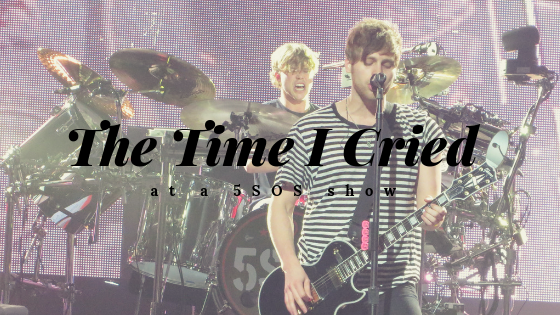 They would never fall in love with a girl sobbing so hard during "She Looks So Perfect". News flash, crying or not, they still wouldn’t have fallen in love with me. After what felt like the longest rendition of "She Looks So Perfect", the lights went on and the balloons were gone. I was still sobbing like a baby. Given my lack of sleep and need for food, it’s no surprise that I couldn’t stop crying. The sprain of my finger was just the tip of the iceberg. In a blur, I remember security giving me an ice pack (while my mom was still laughing). I plopped onto the bed in the hotel room with my swollen, immobile finger. As 5SOS say, take the high with the low, and I had definitely experienced them both that day. I saw 5SOS four more times that summer. Each time the balloons dropped, my heart stopped. I never attempted to hit one of them again and held my breath until they were gone. Thankfully, 5SOS no longer have the balloons, so I can enjoy their shows without worry. The next time I cry at their concert, hopefully it’s tears of joy.